Snoring may seem like a trivial problem, but if it’s loud and chronic, it may be a warning sign of sleep apnea. Not only does loud snoring prevent both you and your partner from finding restful sleep, but your overall health could be at risk. You probably already know about CPAP machines, maybe you’ve heard stories of your friends ripping them off in the middle of the night, but thankfully we have an alternative solution with oral appliance therapy. Left untreated, sleep apnea can cause serious health problems and can even be fatal. Obstructive sleep apnea (OSA) develops when the soft tissues in the back of the throat collapse during sleep, blocking the airway, making it difficult to breathe properly throughout the night. The most common symptom is loud, chronic snoring, but other signs include frequent sleep disruptions, daytime fatigue, morning headaches or dry mouth, anxiety and depression, the list goes on. Left untreated, the immune system begins to crash without proper bodily healing overnight, and blood oxygen levels become dangerously low. 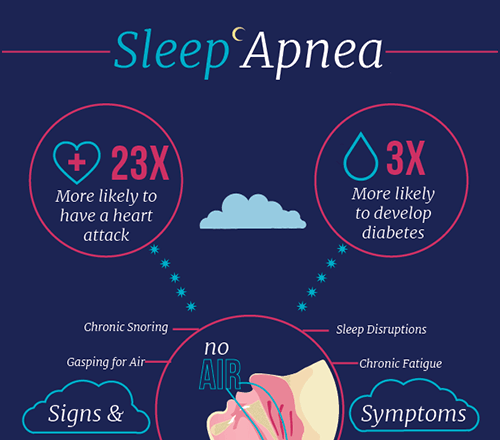 Over time, sleep apnea can significantly increase your risk for serious health problems including hypertension, heart disease, heart attack, stroke, diabetes—it can even be deadly. The good news is, we can effectively treat OSA without a CPAP machine! You can breathe easy throughout the night without a CPAP machine—what a relief! The “gold standard” for sleep apnea treatment is still the CPAP machine because it is highly effective when used properly. However, most people find sleeping with a mask, tube, and machine hooked up to their face uncomfortable and invasive, so compliance rates are low. Thankfully, there is an alternative with oral appliance therapy! We can create a custom oral appliance, designed to fit your mouth comfortably and gently shift the lower jaw forward. This slight shift in the position of your jaw is enough to keep your airway open, allowing you to breathe easily throughout the night. We use SomnoMed® appliances, which report high compliance rates of 88%, and 9 out of 10 patients report their device is comfortable. Contact your Clemmons sleep dentists, Drs. Kingery and Kingery today to schedule a sleep consultation. If you don’t have insurance, we have flexible financing options available.